Help make your eyes stand out with an eye lash curler. These lash curlers can help take your lashes to the next level without having to add false lashes or more mascara. 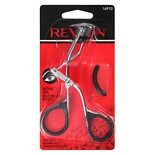 Some eye lash curlers from Revlon, Maybelline and Sally Hansen can curl your lashes whether or not you have already applied eye mascara. Choose an eye lash curler that's made to give you the level of curl you want, whether it's dramatic or flirty. Most come with a refill pad to gently cushion your lashes as they curl. Curlers are made to fit the length of your eye, so you don't have to take the time to curl different sections. 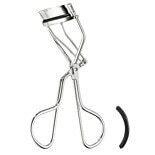 Try an eye lash curler with cushioned grips for your fingers to help keep your hands comfortable. Don't forget to find your favorite mascara among our selection of cosmetics. Waterproof mascara is ideal for a day at the beach or pool, and is usually easily cleaned off with eye makeup remover. You can use volume mascara to give you full, lush lashes. There is also lengthening mascara, and curl mascara that can add a dramatic effect. Browse eyeliners, eye shadow and eyebrow shapers to help finish your look.